On Friday at 8:45 a.m. EST, the Crew Dragon splashed down in the Atlantic Ocean off the coast of Florida, Space.com reported. 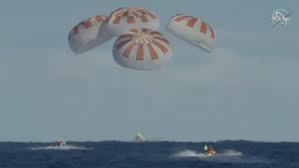 The capsule, which deployed its parachutes to land in the water, was safely retrieved by SpaceX's Go Searcher recovery ship. Following this initial mission, the Crew Dragon might be ready to take astronauts to space in a couple of months. Yesterday, astronauts at the ISS closed the Crew Dragon's hatch and prepared it for its journey back to Earth. The Crew Dragon capsule returned with 330 pounds of experiment results and additional gear from the ISS, which will be used for future scientific research. On March 3, the Crew Dragon successfully docked to the ISS, marking a major step in space travel for NASA and SpaceX. For the Demo-1 test flight, the Crew Dragon transported a sensor-packed dummy named Ripley and some supplies to the ISS. Even though the Crew Dragon didn't carry any real astronauts, Ripley was joined by a plush Earth toy called "Little Earth," which was a fun surprise for the ISS crew and everyone watching the mission.